One could argue that the United States is entering another important moment in alcohol history with today's craft beer movement, as we witness a shift, or at least a shake-up, in the symbolic meaning and cultural role of beer in particular (as opposed to alcohol in general). According to the Brewers Association, the highest number of breweries operated in 2009 in the U.S. since before Prohibition. And while beer sales overall were down 2%, craft beer sales were up 10% over 2008. Aside from flavor and quality, what craft beer drinkers are buying into, at least on some level, is the definition of craft beer itself, "small, independent, and traditional." Yes, in the hops of United States' favorite national pastime lie seeds of challenge to a capitalist-consumerist view of alcohol championed by big breweries like Anheuser-Busch/Inbev and Miller/Coors. While differences in age, class, status, aspirations and affiliations are frequently expressed through beverage choice, the most consistent and widespread use of alcohol as a social ‘differentiator’ is in the gender-based classification of drinks. Almost all societies make some distinction between ‘masculine’ and ‘feminine’ beverages: even where no other differentiation is found, this primary division is likely to be evident, and, often, to be rigidly observed. Even in societies where only one alcoholic beverage is available, such as palm wine among the Lele of Zaire, a weaker, sweeter version, Mana ma piya, is considered suitable for women, while Mana ma kobo, described as ‘strong’ and ‘fierce’, is a man’s drink (Ngokwey, 1987). This literal association of the qualities of men’s and women’s beverages with ‘masculine’ and ‘feminine’ attributes is also a near-universal phenomenon. ‘Feminine’ drinks are often weaker, sweeter, softer or less ‘pure’ than their ‘masculine’ counterparts (Freund, 1986;Gefou-Madianou’s, 1992; Papagaroufali,1992; Purcell, 1994; Macdonald, 1994; Nahoum-Grappe, 1995). Where female drinking is particularly deplored but nonetheless occurs, alcoholic beverages consumed by women are often conveniently granted a sort of honorary ‘non-alcoholic’ status, such that their consumption does not count as ‘drinking’ (McDonald, 1994; Purcell, 1994). Among Scottish Highlanders, the classification of ‘ladies’ drinks’ as ‘not really alcohol’ may occasionally be taken too literally: Macdonald (1994) recalls an incident in which a drunken man who drove his car off the road one night, miraculously escaping serious injury, "insisted that he had not been ‘drinking’ – he had only had Bacardi and Coke!" 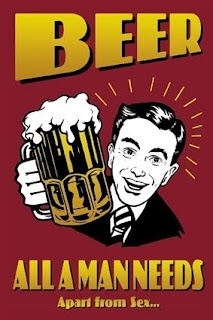 Even in societies where there is less disapprobation attached to female drinking per se, we find that certain drinks are considered unfeminine, while others are regarded as too feminine for male consumption (Engs et al, 1991). The symbolic potency of alcohol is such that the appropriation of ‘male’ drinks by women may act as a more effective feminist statement than conventional political approaches such as demonstrations or pamphlets (Papagaroufali,1992; Fox, 1994). The gender lines of the craft beer movement is just one part of a very interesting conversation that's waiting to be had. For instance (and to return briefly to the distant place where this post started), does the situation of craft beer in the big picture indicate a shift away from a work ethic that has skewed and stunted the U.S.'s perception of work and happiness (See the Center for Economic and Policy Research's report, "No-Vacation Nation")? This is a really interesting post! I think it is significant that gender stereotypes are being challenged by the craft beer movement, although I might argue that women can "safely" drink wine, and have had a role in the prominence of the wine industry (although I admittedly know more about the beer industry). I think it has become widely accepted in the US that women enjoy drinking, the bigger shift is that women are becoming producers of alcohol (craft beer). It would be interesting to explore this in greater depth - the implications of a gender shift in production of such a popular and historic product.